There are two main cell phone companies here in Peru. 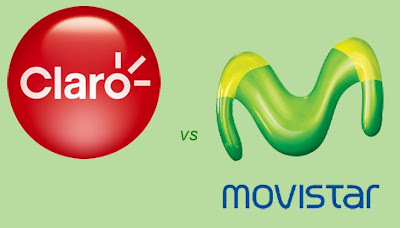 Claro, and Movistar. They are always battling and fighting each other. Almost every building or store has a sign from one of the two companies. The Claro company appeals more to the techy, artsy, alternative people. Movistar appeals more to pop, emo, rocker people. That is just the conclusion i have drawn from the marketing schemes. My question to everyone who reads this is.... Which logo do you like better? Ill keep my eyes out to post some pictures of exactly what I mean by a battle. Its pretty crazy! So which logo do you like better? i like the movistar one cause it reminds me of flubber! movistar since it reminds me of limewire. movistar, mostly because i just dont' like red.